Next week is Precon Week, but I’ve decided to step it up a bit and make it precon month for Unexpected Results. First up, I won’t be talking about the Commander precons; instead, I’m going to take a look at another commander choice I touched on a few weeks ago… The time has come for me to return to Teysa. As it turns out, taking one of each card in the three Orzhov precons gives you 66 cards… A perfect start for tuning them into a unified Teysa deck. Obviously, this is a subpar start, so how about we get to tuning. The first glaring flaw in this proto-deck is that there are four (french)vanilla creatures. This is a format about value, so unless you’re these have no place here. I am going to restrict myself to replacing them only with things of the same cost though. 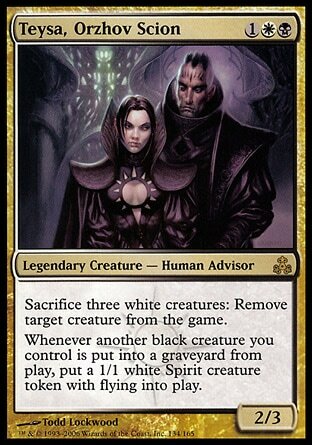 This is obviously going to be a token deck on some levels, so Endrek Sahr and Stormfront riders fit well; the low spell density also makes Thalia viable; Reveillark reanimates pretty much everything; and Reassembling Skeleton provides more tokens from Teysa. There was barely any removal, and most of what was there was bad, so adding solid removal package was vital. Bad things out, good things in! Also, my first mention of a new Commander card in Ophiomancer, which I can see becoming a staple for Teysa 1.0 decks. Now this is starting to look like a deck!